Rosthwaite is a very small village, six miles south of Keswick, consisting of a few houses, the Royal Oak pub and the Flock-in Tearoom for walkers. The Royal Oak, once an 18th century farmhouse and former miner’s tavern has been providing accommodation for visitors and walkers for over a hundred years. Since 1970 this small family run hotel have taken great pride in maintaining the homely atmosphere and excellent value for money. The Flock-in, a walker’s tearoom, provides a good varied menu of local homemade food including gluten free soup, cake and ice cream. The tearoom at Yew Tree Farm is based in a barn opposite the farmhouse which provides bed and breakfast accommodation. Castle Crag at 945 metres is one of the smaller hills in the valley of Borrowdale and rises between Broadslack Gill and the River Derwent. Although below a 1,000 feet it is a very impressive rugged hill with steep faces on all sides except the south. The slopes and the summit of Castle Crag have been extensively quarried with pits and levels on the northern and southern sides. The summit area, a rock outcrop of about 8 ft high and 12 ft across, was an ancient Iron Age hill fort and later a Romano-British settlement. On the summit you will find a well constructed circular cairn of slate affixed to this is a memorial to the Borrowdale men killed in World War I. The views are stunning to the north Skiddaw can be seen across Derwent Water and to the south Great Gable and the Scafells. Castle Crag can be ascended easily from the villages of Grange or Rosthwaite and can be combined with the lovely riverside walk along the River Derwent. The Cumbrian Way is a 70 mile long distance footpath passing through the heart of the Lake District National Park linking the two historic towns of Ulverston and Carlisle. The route cuts through the most beautiful Lakeland countryside via Coniston, Langdale, Borrowdale, Derwent Water, Skiddaw Forest and Caldbeck. The Cumbrian Way was originally developed in the 1970’s by local Ramblers’ Association members and is mainly low level but does contain some high level exposed sections and the highest point is High Pike at 658 metres (2,159 ft). The waymarking of the entire route was completed by volunteers and national park staff in May 2007. 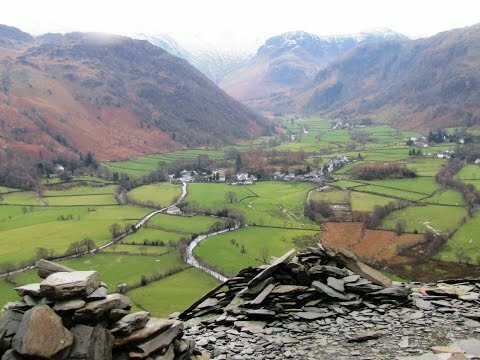 The Allerdale Ramble is a 54 mile long distance footpath starting at Seathwaite at the southern end of Borrowdale. The route makes its way through Borrowdale and along the west side of Derwent Water to Keswick. The route then climbs over Skiddaw, there is another alternative path, both of which then follow the north east side of Bassenthwaite Lake and then on towards Cockermouth. The route splits again staying on the north side of the River Derwent or through Cockermouth either way the paths join again and heads west towards Maryport and the coast. The route splits again one goes into Maryport and the other direct to the open shoreline. The path then joins the Cumbrian Coastal Way for the final sections up the coast to Grune Point. We turn right out of the car park and head forwards down the lane also the Cumbrian Way. At the white building, Yew Tree Farm, we bear right past the Flock-in tearoom for walker’s and continue on the track until we come to the River Derwent. We follow the track round to the right with the river on our left then cross over the bridge and turn right. We head forwards then cross over the stile on the right now following the river on our right. After a short way the track turns to the left we ignore the gate on the left and bear round to the right. We go through the gate into the woods with the river still on our right. We follow the path through the woods and a disused quarry a little way from the river. We then head uphill to follow the signpost for Grange. We keep heading forwards through a wall and turn right slightly downhill back to the side of the river. We head forwards following the path then go through a gate heading downhill. At the signpost just before a bridge we turn left for Seatoller and Honister. We are now leaving the Cumbrian Way and follow The Allerdale Ramble. We follow the track uphill with Broadslack Gill on our right. Eventually we cross over the gill at a little stone slab bridge and keep heading forwards uphill for a short way. Just near the brow of the hill we turn left on the unmarked path uphill. We keep following the path which winds very steeply up through the spoil heap. At the top of the spoil heap we take the path up to the summit of Castle Crag. We then make our way back down to the bottom of the spoil heap and take the path on the left over a ladder stile in the wall. We now follow the path downhill to go through a gate. The path bears to the left and right until we reach the bottom and the River Derwent. We then turn right and follow the track we came in on back to Rosthwaite. This is a moderate to hard walk on good paths and tracks with some steep inclines and declines. Approx 3.5 miles allow 1 hour 45 minutes using OS Explorer map OL4, The English Lakes North-Western area. Rosthwaite is in Borrowdale in the Lake District, Cumbria. From the A66 coming from the east take the A5271 for Keswick. At the junction turn right. At the traffic lights carry on forward. At the mini roundabout turn left then left again at the junction. At the roundabout go straight over then at the next roundabout turn right and follow this road passing Derwent Water then Grange on the right. Continue on to Rosthwaite and turn right at the car park sign. The car park is on the right. Parking: The Borrowdale Institute car park £3 all day honesty box and the main pay and display car park. There are public toilets just next to the car park and for refreshments there is the Royal Oak pub in Rosthwaite on the main road and the Flock-in Tearoom at Yew Tree Farm.